A college that has plummeted two Ofsted grades from its previous ‘outstanding’ has insisted its bid to open an Institute of Technology is “not in jeopardy”. Swindon College was rated ‘requires improvement’ overall and in five out of eight headline fields, in a report published today and based on an inspection in December. It was shortlisted by the Department for Education last May to open an IoT, but today’s verdict means it no longer meets the original application criteria – which stated that colleges must be rated at least ‘good’ overall by Ofsted. However, a spokesperson for the college said that it had met “all of the quality criteria set” when it submitted its bid in time for the stage two deadline in November – the guidance for which is not in the public domain. “The IoT bid criteria is quite clear and therefore this is not in jeopardy”, she added. The college’s new Ofsted grade “does not affect the evaluation” but “may be discussed at interview stage”. 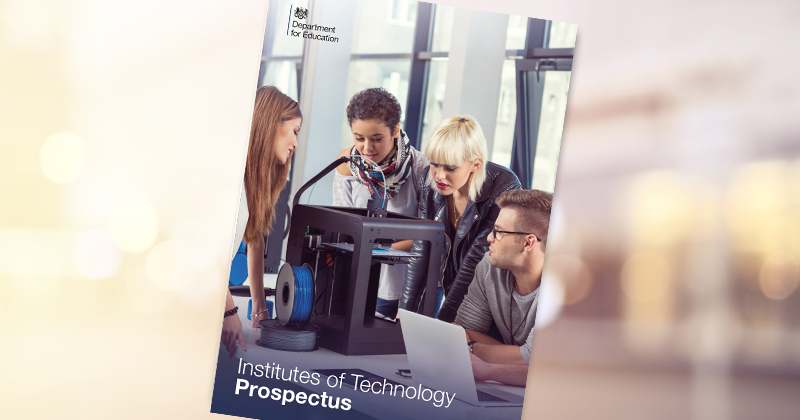 The spokesperson also pointed out that the college’s apprenticeships and adult learning provision – which she said the IoT provision would be “predominantly focused on” – had both been rated ‘good’. FE Week has asked the DfE to confirm if Swindon College would remain in the list of 16 IoT finalists, but has yet to receive a response. IoTs were first mooted back in 2015, and it’s expected that 10 and 15 of the institutes will be created. They’re intended to bring FE and HE providers together, along with employers, to deliver technical skills training with a particular focus on levels four and five, and will be backed by £170 million of capital funding between them. Swindon isn’t the first shortlisted college to have slipped below the IoT minimum criteria after submitting its bid. College group giant NCG has remained in the list of finalists, despite being downgraded to ‘requires improvement’ by Ofsted in June. However, a DfE spokesperson said in July last year that colleges would need to be rated at least ‘good’ by the deadline for stage two applications – meaning it’s unlikely to have progressed further. The fate of North Warwickshire and South Leicestershire College’s bid is also up in the air, after it was assessed as having ‘inadequate’ financial health by the Education and Skills Funding Agency in September – another key criteria for an IoT bid. Inspectors noted in today’s report that Swindon had been through “challenging times” since its previous inspection in 2013, and leaders had “failed to maintain standards”. This was attributed in part to the “many changes in staff and leadership”: a “large number” of teachers and managers had left the college in that time, and a middle-management reorganisation in 2015/16 was “unsuccessful”. “The current leadership team is making well-considered changes but has much to do,” the report said. The proportion of apprentices and learners on study programmes to have achieved their qualifications had “declined over the last four years” – with the latter now “too low”. However, both adult learning programmes and apprenticeships were rated ‘good’. A college spokesperson said it had “identified our key areas for development and we are fully committed to implementing plans based on the report recommendations”. The successful IoT bidders are set to be announced in March, and the aim was for the first institutes to open in 2019 – although it’s not clear if that’s still the case.